My cousin Matt came and taught us how to make Artisan Bread. We used this recipe from my cousin Michelle (Matt's sister). We baked it in the Dutch Oven Pepe got for Father's Day. Formula and process created by Jim Lahey, owner of Sullivan St Bakery. Mix all of the dry ingredients in a medium bowl. Add water and incorporate by hand or with a wooden spoon or spatula for 30 seconds to 1 minute. 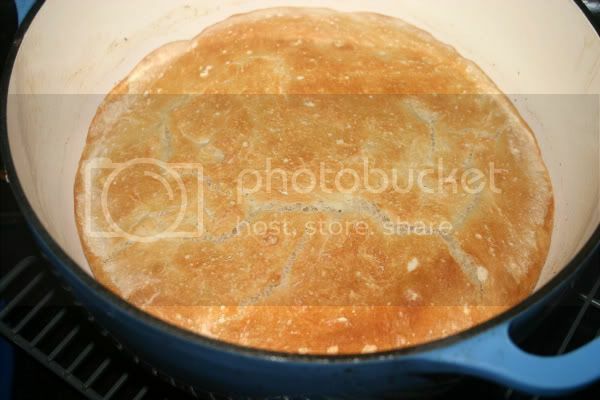 Lightly coat the inside of a second medium bowl with olive oil and place the dough in the bowl. Cover the bowl with plastic wrap and let the dough rest 12 hours at room temperature (approx. 65-72°F). I've been wanting to try this recipe. Thanks for posting.